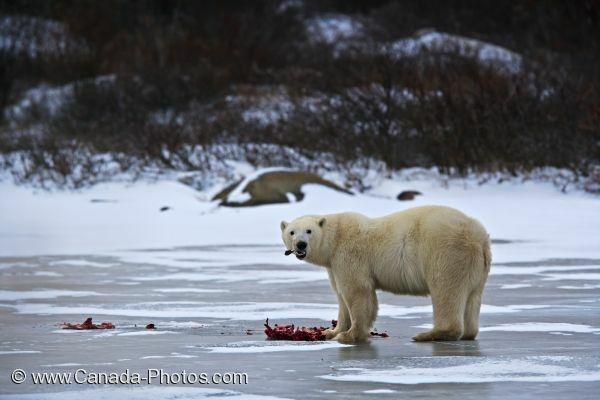 The landscape and the lakes near the shores of the Hudson Bay in Churchill, Manitoba have frozen, making it easier for a polar bear to find his favorite food source. This Polar Bear has captured a Ringed Seal and brought it onto a frozen lake where he keeps a close eye on his surroundings. Ripping away at a Ringed Seal, the Polar Bear will leave the meat and eat the skin, fat and internal organs. Endless meals of Ringed Seals will ensure a Polar Bear fattens up before the onset of Spring when the ice begins to melt. Picture of an adult Polar Bear enjoying his favorite food source, a Ringed Seal, on an frozen lake in Churchill, Manitoba.